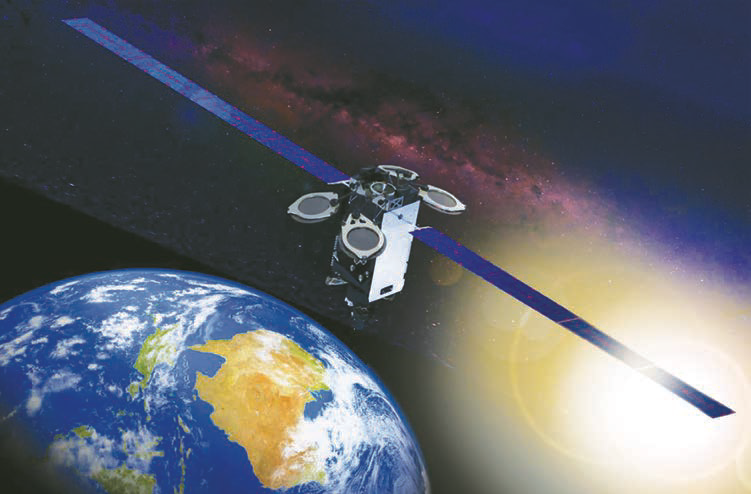 Artistic rendition of the Intelsat Horizon-3e satellite. The change has been a long time coming. We industry veterans here at Intelsat General and our colleagues at other commercial satellite providers have been pushing for reform for the past decade. This move is not simply a shuffling of the deck chairs. Rather, it is an important step toward a future wideband SATCOM architecture that defines a clear role for COMSATCOM. Several Air Force leaders, including General John Hyten and General Jay Raymond, have long been advocates for the U.S. Government (USG) solidifying the COMSATCOM role in the Department of Defense (DoD) space mission and taking full advantage of commercial capability. General Raymond, in particular, was instrumental in supporting the decision to shift commercial satellite services procurement from the Defense Information Systems Agency (DISA) to the U.S. Air Force, which is also responsible for the nation’s military satellite constellations. We were also pleased to hear Grason say that once her group is part of AFSPC, she will change their procurement practice of primarily using “lowest price technically acceptable” (LPTA) evaluation criteria. We have long argued that LPTA contracting does not provide the end user — often a warfighter —with the best satellite solutions. Quite the opposite: it often rewards bad behavior. I think both taxpayers and our lawmakers would be stunned to know that companies would bid on a DoD LPTA contract with a premeditated plan to change the technical solution after award — as we saw in a recent COMSATCOM acquisition. Ask yourself: Why would they need to change the technical solution before it was even implemented? While this may or may not violate federal rules, it is clearly not the intended use of LPTA — which is meant for use in purchasing commodities that are identical regardless of supplier. After years of industry input that at times seemed to fall on deaf ears, we are excited to see significant change in how the U.S. military will be using commercial satellite services. The changes could not come at a better time for Intelsat General, as we complete the final piece of our Intelsat EpicNG high-throughput satellite constellation. The Horizons 3e satellite, launched in September of 2018, has entered service with coverage over East Asia and the Pacific. With H-3, military and other government users will have access to a seamless global fabric of high-throughput spot beams overlaid with Intelsat’s constellation of widebeam satellites, providing coverage of operations around the world. The global Epic coverage is the underpinning of our fully managed FlexAir service, providing a variety of mobile communications solutions for the military’s manned and unmanned aircraft operations. FlexAir takes advantage of the high data rates provided by the Intelsat EpicNG constellation, giving users up to 10 times the data throughput of other managed networks. FlexAir is a perfect example of how the COMSATCOM marketplace responds to the needs of the USG and DoD user. 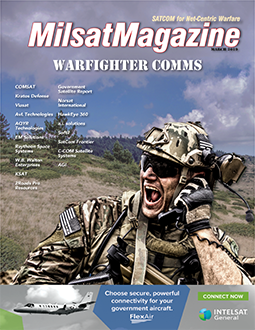 With an integrated COMSATCOM—MILSATCOM architecture, there is so much we can do. From unique coverage and resilient hosted capacity, from beam forming to fully software-defined satellites even mission specific busses, the DoD’s change in how it acquires and uses COMSATCOM has the potential to be a game changer for both government and industry. Skot Butler is responsible for managing an integrated sales, marketing and business development organization which serves all of Intelsat General’s customers, including the U.S. Department of Defense, NATO, various civil agencies and commercial enterprises within the United States and Europe. Mr. Butler brings to the position two decades of experience in the commercial satellite communications and telecom industries. He joined IGC in 2006 as Director of Hosted Payload Business Development and was most recently Director of Solutions Development. 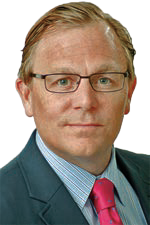 Preceding IGC, Mr. Butler held sales, business development and strategy roles at satellite services companies DRS, Spacelink and Verestar. The company launched FlexAir in December of last year and offers a managed, end-to-end service that provides in-flight broadband connectivity to a wide range of military aircraft to support en route communications and intelligence, surveillance, and reconnaissance (ISR) applications. FlexAir’s broadband service uses Intelsat’s global Ku-band satellite fleet and integrates layers of High-Throughput Satellite (HTS) coverage from the company’s Intelsat EpicNG fleet — these wide-beam satellites deliver the added redundancy and security needed for the most critical missions. FlexAir also offers committed capacity for ISR applications, such as sensor data, video transmission, and communications relay to deliver immediate access at 3 Mbps from the aircraft with optional scalability to 6 Mbps. FlexAir answers the call and delivers the performance and agility that government aviation requires. With the multi-layered coverage of FlexAir, government customers can ensure that each aircraft has global access and guaranteed availability whenever or wherever it is needed. The scalability, throughput and improved economies of scale provided by FlexAir enable government users to quickly address changing broadband demands while providing maximum mobility in the most cost-effective manner. FlexAir aggregates Intelsat’s high-performing space segment with the IntelsatOne ground infrastructure into a simplified and streamlined ecosystem. It is anchored on industry-leading technology and utilizes the redundancy created from a fabric of overlapping beams. As a result, government users are assured coverage and connectivity for any operation, conducted in any area of the world, without interruption. Intelsat uses Ku-band, wide beams, spot beams, and frequency reuse technology to provide a host of customer benefits. Intelsat EpicNG can deliver up to 15x more throughput per satellite, ensuring high quality connectivity. Multiple Intelsat EpicNG spot beams enable a high concentration of power on smaller areas, improving efficiency and the aggregate amount of capacity available. With the bigger channel size of bandwidth going into each Intelsat EpicNG beam, government organizations benefit from as much as 10x the capacity of competitive offerings, ensuring that they can support 10x as many users without impacting performance. In addition, FlexAir is designed to be compatible with a wide range of fuselage and tail-mounted antennas, maximizing the performance of carriers for the various end-user antennas. FlexAir leverages the security enhancements of Intelsat EpicNG’s advanced digital payload. The design of the digital payload enables the user to quickly identify when someone is trying to jam a signal and then quickly switch to a different beam, mitigating any impact from the interference attempt. FlexAir provides additional security as only designated beams with frequency bands carrying authorized signals that are cross-connected and as a result, any interfering signals are muted, analyzed, and mitigated. According to the company, the FlexAir service provides the most competitive offering in the marketplace, delivering the highest data rates at the lowest cost per bit. The service also enables government users to select among several service offerings, allowing them to choose the right plan based on their data rate and geographic needs without having to make an upfront commitment. With multi-layered, seamless, and consistent coverage, government users have the agility to optimize their service, provide a predictable cost structure that meets budget requirements, and deliver real value to Warfighters.